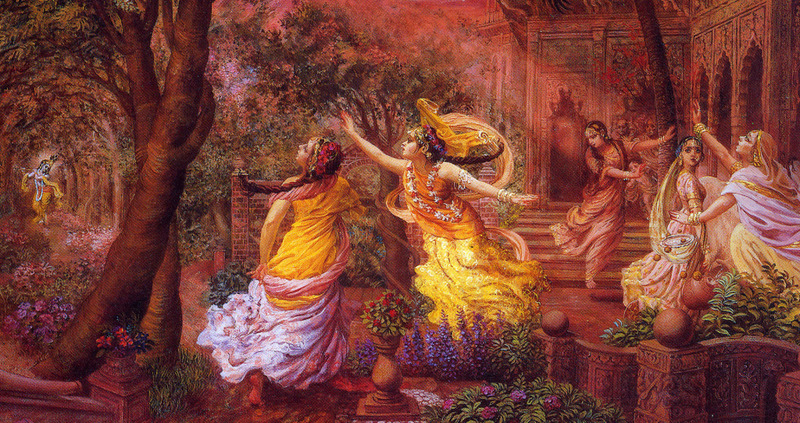 Why an exalted devotee asked Lord Krishna to keep putting her into dangerous situations. A devotee who has developed intense love for Krishna cannot live for a second without seeing or serving Him, the pain of separation from Him being too unbearable. 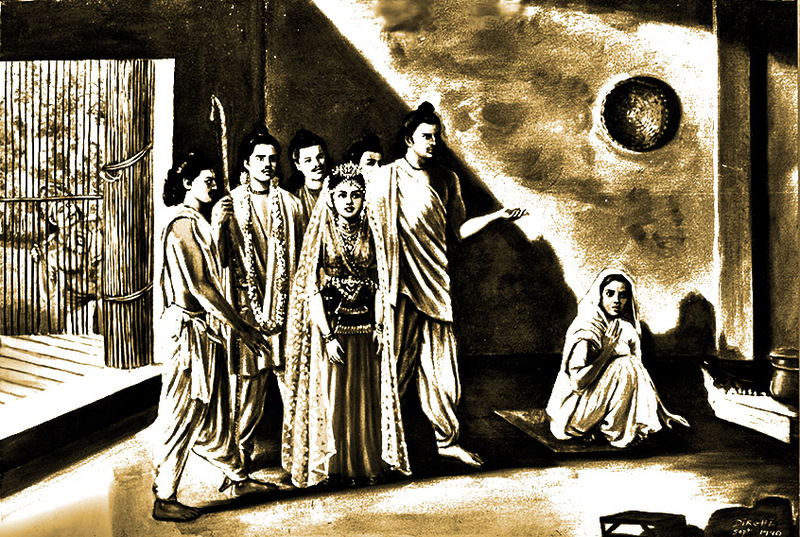 One such devotee was Queen Kunti, the mother of the five Panhava brothers. The Mahabharata explains how Kunti underwent great sufferings throughout her life. Before getting married, she gave birth to Karna, her first son. Being a maiden, however, she rejected him to save herself from social condemnation. Soon after getting married, her husband, Panhu, died, and Kunti raised her five children alone. Although Kunti and her sons were supposedly under the care of King Dhrtarastra, Panhu’s elder brother, Duryodhana and the other sons of the king mistreated the Panhavas and even tried to kill them by several means. When Duryodhana tried to kill them by burning a house of shellac he had given them as their residence, Kunti and her five sons secretly escaped and hid in the forest. When Duryodhana arranged a gambling match to rob the Panhavas of all their wealth and possessions, the Panhavas were forced to take part in it. The match was rigged; the five brothers lost everything and were banished to the forest for a thirteen-year exile. During this period, Kunti stayed back in the palace and spent all those years without her dear sons. Finally, in the Battle of Kurukshetra, even though the Panhavas emerged victorious, Kunti bore the loss of many of her grandsons and other relatives and well-wishers. Love in this world is evident in various ways between two individuals. Generally, the lover and the beloved like to spend all their time together without any hindrance. When some external forces situations, relatives threaten their relationship, their love only intensifies. The bond between them strengthens, and their relationship becomes sweeter and more dynamic. 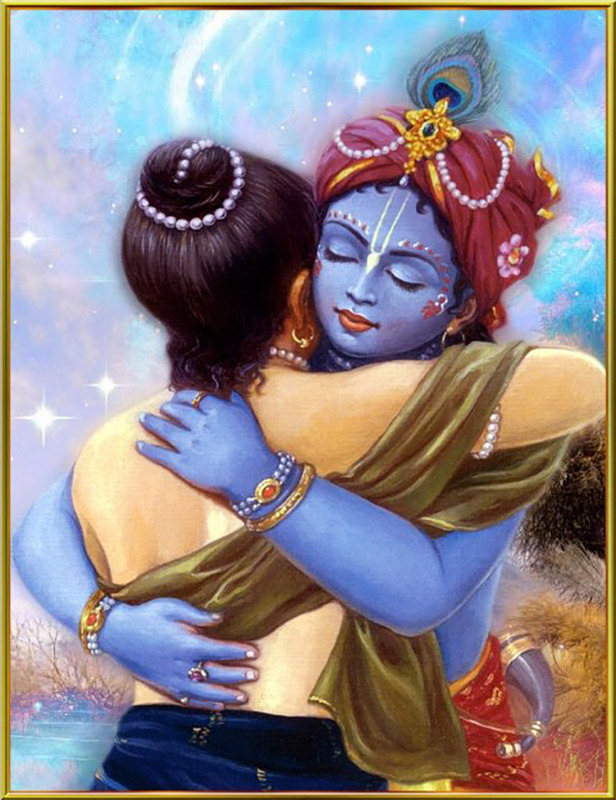 Devotees experience a similar kind of love dynamics in their relationship with Krishna, the perfect loving relationship. Devotees always want to serve Krishna directly, but to increase their love for Him, Krishna sometimes puts them into difficult situations. He generally does this by adjusting the devotees’ karmic backlog to bring them closer to Him. For pure liberated devotees, who have no karmic backlog, Krishna puts them into the midst of great calamities to teach others by their exemplary faithful response. Those less accomplished on the spiritual path can thus learn how to face adversities with dignity and integrity. When facing difficulties, the pure devotee completely surrenders to Krishna, sure of His protection. 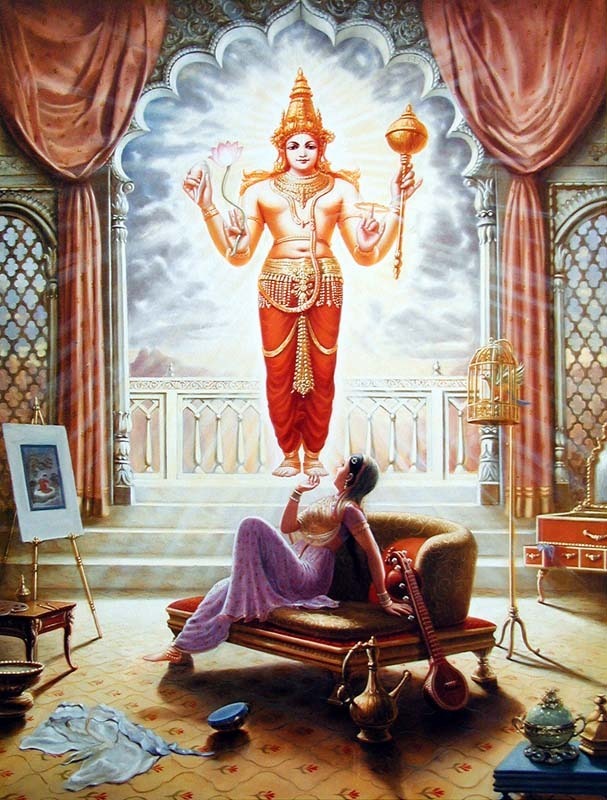 On encountering the Lord’s loving reciprocation in such situations, the devotee’s love for Him increases many times. Devotees realize that all past difficulties were great blessings because the Lord was always there, protecting them at every moment. Devotees consider the pain of calamity insignificant when compared to the pain of separation from the Lord. Those who can perceive the Lord’s loving embrace during calamities will welcome them. They understand that the Lord is a loving father who will always give protection. They accept all situations in life gratefully, considering them Krishna’s arrangement for their purification. In her prayers to Lord Krishna, Kunti recalled the various miseries Duryodhana had inflicted upon her and her sons. 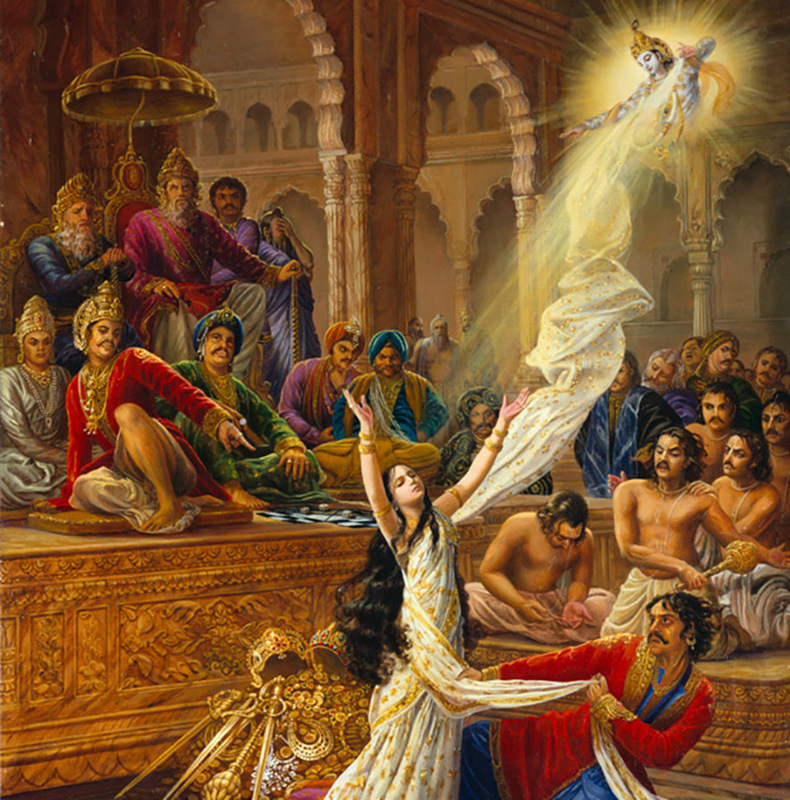 When Draupadi, the Panhavas’ wife, was being disrobed in front of the Kuru assembly, Krishna miraculously saved her from humiliation by supplying her an unlimited sari. During their forest exile, Durvasa Muni and his disciples came to their place upon Duryodhana’s request, and Krishna, by his mystic potency, saved them from the Muni’s wrath. In the Battle of Kurukshetra, Krishna became Arjuna’s charioteer and guided him in overcoming mighty Kuru warriors like Bhisma, Drona, Karna, and Jayadratha. And when Asvatthama released the brahmastra weapon to kill the grandson of Arjuna within Uttara’s womb, Krishna covered the womb by His personal energy and protected the child. While remembering these events, Kunti realized that they could never have overcome these dangers without Krishna’s presence. When Krishna was leaving for Dwarka after installing Maharaja Yudhisthira as the world emperor, Kunti submitted the above prayer before Him because she feared that now that they were comfortable in their royal position, she might forget Krishna. Therefore, she prayed to Krishna for more sufferings, which would help her continue to remember Him. In the case of Kunti and the Pandavas, Krishna saved them in extraordinary ways, using His mystic powers. 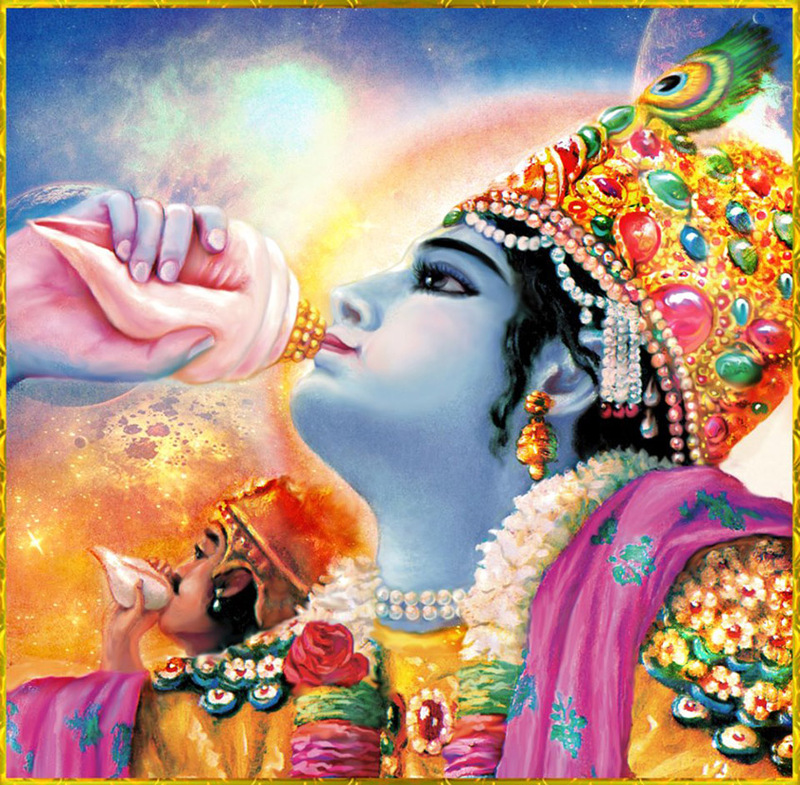 Every time their lives were in danger, Krishna protected them from death. The scriptures relate many stories where devotees have felt Krishna’s protection in times of crisis. Devotees in recent times, too, have perceived Krishna’s inconceivable protection in dangerous situations. In most cases, however, Krishna’s protection may not come in the form of protection from death. A practicing devotee must firmly understand that the body is temporary and destined to perish. As spirit souls, we are distinct from the body, so we should not always expect that Krishna will protect us from death. Real protection is the protection of our consciousness of our devotional faith and our remembrance of Krishna. By Krishna’s mercy, a devotee who dies gets a favorable environment and good opportunities to continue devotional service in the next life. We should stop asking for material benefits, which are temporary and illusory. We may sometimes pray for material things to aid our service to the Lord, but even such prayers should be accompanied by and subservient to the prayers that intensify our devotional service in any circumstance. Many people who claim to be religious pray for life’s material necessities. Ignorant of a higher objective in life, they try to fulfill their utopian dreams in this illusory world. Kunti’s prayer, therefore, is far superior to prayers offered to God asking for material rewards. Her prayer transcends all the selfish and ulterior desires that usually motivate the practice of religious faiths. Mukundamala Dasa serves full time at ISKCON Mumbai (Chowpatty). He is part of the India BTG team and teaches Krishna consciousness to students. Krishna An Immoral or Trans-moral God?